Part of responsible pet ownership is getting your dog his vaccines to help protect him from contagious, potentially life-threatening diseases. Vaccines work by introducing harmless antigens of commonly encountered diseases into your dog's body to train his immune system to recognize and ward off the pathogens if he encounters them in the future. Although puppies need their core vaccines, the immunizations might cause a few mild side effects. 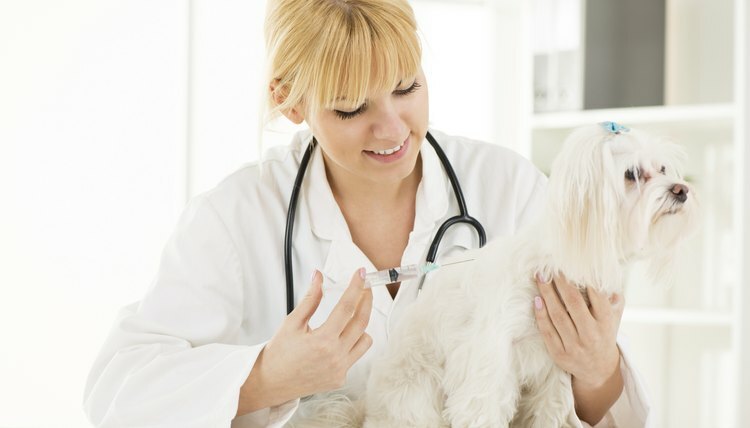 Several vaccinations are considered crucial for all dogs, while other vaccines are recommended only in certain circumstances. The crucial vaccines, called core vaccinations, commonly come in a 3-in-1 DHP combination injection or a 4-in-1 DHPP vaccine that protects against canine parvovirus, distemper and canine hepatitis. The DHPP combo vaccines also include a non-core vaccination against parainfluenza. All of those diseases are highly contagious and can be life-threatening. While combo vaccines are typically safe for canines, side effects can occur. The injection site might be sore or swollen. Some dogs also experience loss of appetite, low-grade fever and mild depression or lethargy. These side effects generally last for 24 to 48 hours after the injection. Call your vet if the side effects don't diminish after two days. Although rare, some dogs have a serious allergic reaction to vaccines. Consult your vet immediately if your pet suffers from persistent diarrhea or vomiting, has trouble breathing or experiences facial or leg swelling. These symptoms can appear anywhere from minutes to days after receiving the vaccine, and the reaction can kill your doggy if left untreated. The rabies immunization is a core vaccination not included in combo vaccines. Rabies is a highly contagious and frequently deadly virus that can infect any warm-blooded animal, including dogs and people. It passes through bodily secretions and is most commonly transmitted through bites. The virus damages the brain, causing severe disorientation, restlessness and aggression. There isn't any rabies treatment or cure as of January 2015, so prevention through vaccination is your only course of action. Puppies occasionally experience mild side effects from a rabies vaccine. You might notice redness or swelling at the injection site, and some dogs run a low-grade fever, which causes fatigue and appetite loss. On rare occasions, dogs have a serious allergic reaction to a rabies vaccine. Call your vet immediately if your puppy vomits or has diarrhea, collapses, breaks out in hives or experiences breathing difficulties. Puppies need their initial combo vaccine when they reach 6 to 8 weeks old. They then need booster shots every three to four weeks until they reach 15 to 18 weeks old. Although it might sound like a lot of vaccines, puppies are more vulnerable to illnesses after they quit drinking their mother's milk, which is naturally full of disease-fighting antibodies and nutrients. Dogs should receive their first rabies vaccination when they reach 12 to 16 weeks old. Dogs need a rabies booster 12 months later. After that, the laws on rabies vaccine requirements vary according to your location. Most states require vaccines every one to three years to keep your pet protected. Although puppy shots come with the small risk of side effects, the benefits of the vaccines typically far outweigh any possible reactions. Vaccines have saved countless doggy lives and reduced the spread of infectious canine diseases. Schedule your puppy's vaccines at a time when you can keep an eye on your pet for at least 48 hours afterward. Should My Ferret Be Vaccinated?